Stripe (yellow) rust is one of the most destructive diseases in wheat production. More than 80 stripe rust resistance (Yr) genes have been officially named, however Yr26 gene has lost resistance to CYR34 (V26) since 2011. 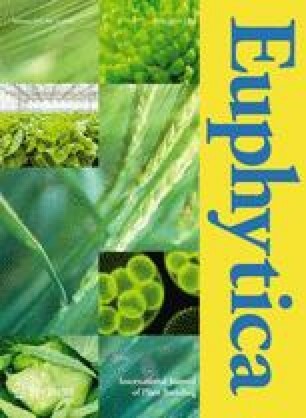 In this study, we evaluated resistance of 692 elite wheat cultivars from China to stripe rust in adult plant stage and resistance to CYR32, CYR33, and CYR34 Pst races in seedling stags. Yr26 was deduced in 692 cultivars by WE173 and WE33 molecular marks. The result showed that 45 (7%) entries had all-stage resistance, 79 (11%) entries had adult-plant resistance, and 568 (82%) entries were susceptible to one or more stripe rust races. Besides, 48 (81%) entries in over-summering region were resistant to CYR34, 4 (10%) in over-wintering region, 121 (20%) in spring epidemic region. And 43 entries across China were detected to have Yr26 gene. The online version of this article ( https://doi.org/10.1007/s10681-019-2383-8) contains supplementary material, which is available to authorized users. This study was financially supported by the National Key Research and Development Program of China (Grant No. 2016YFE0108600), the earmarked fund for Modern Agro-industry Technology Research System (No. CARS-3-1-11), and the National Science Foundation for Young Scientists in China (Grant 31701421). The authors are grateful to the support of the funding mentioned above.